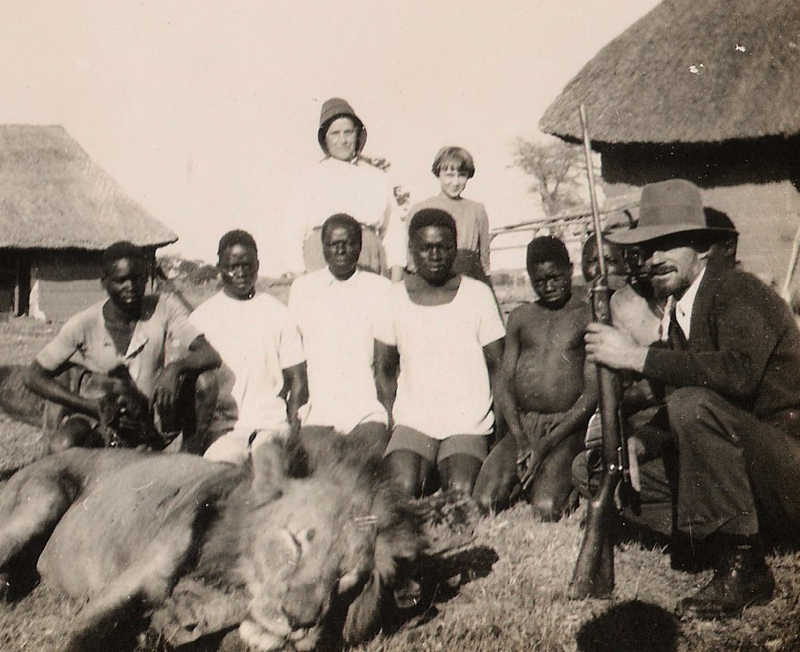 One of the greatest tragedies to befall a Brethren in Christ missionary team occurred in 1931, when Myron Taylor was severely mauled by a lion while on a hunt to capture the escaped animal. Taylor later died from injuries sustained during the attack. After the jump: a report of Taylor’s death from the pages of the Evangelical Visitor. On Monday, September 14, reports came to the [Sikalongo Mission] Camp that a huge lion had been caught in a trap and had broken loose. This was indeed serious for people were constantly passing to and fro to the Camp for food and the lion was in that vicinity. An injured lion would also be more vicious. . . . Brother Taylor volunteered to go [in search of the lion]. Not having his rifle with him, he borrowed one from Mr. Walker and and set out with five boys . . . They found the tracks of the lion and followed him, but were not able to get a shot at him. The lion led them into dense bush and then charged. Brother Taylor, not being familiar with the borrowed weapon, fired twice but missed both times. The third cartridge jammed in the barrel. . . . When the rifle jammed Brother Taylor used it as a club until it was hopelessly demolished and wrenched from his hands. The lion struck him and forced him down backwards. Brother Taylor kicked twice at the lion with his right foot. The second time the lion caught the leg just above the ankle, breaking both bones. Then he tried to protect himself with his arms. The right hand and wrist were crushed completely. Two fingers were bitten off and a third was very badly mangled. His left arm was also bitten in several places. . . . [After the lion left, the] boys, who had fled up the trees, then returned. . . . The boys carried Brother Taylor until Mr. Walker met them with an improvised stretcher and water and gave what first aid he could. About 7 p.m. they started for Sikalongo Mission, thirty miles distant — Brother Taylor being carried by sixteen natives . . . It was a terrible night for Brother Taylor as he had lost much blood and was suffering most excruciating pain.
. . . At first the Doctor had good hopes of his recovery, thinking to give some relief here at the Mission and in a few days to move him to the hospital at Livingstone. However, upon examination and hearing further particulars, he saw that all medical aid, which would include amputating the hand, must be given at the Mission for Brother Taylor almost collapsed when he was dressing the wounds.
. . . Finding Brother Taylor in such a weakened condition, the doctors decided to postpone the operation until morning. However Brother Taylor was gradually becoming worse. He passed away under the anesthetic, September 16 about 8:30 a.m.
For more on Myron Taylor and the work in Africa in the 1930s, see Anna R. Engle, J. A. Climenhaga, and Leoda A. Buckwalter, There is No Difference: God Works in Africa and India (Nappanee, Ind. : Evangel Press, 1950). I read this account many years ago and never forgot it. This experience impressed upon me the great personal sacrifices made by the first missionaries . Some years ago, Roger and Joanne Sider were visiting some of the mission stations in Zambia, and they had their young children with them. Their son heard the story of Myron Taylor and visited the sites. He then wrote and illustrated the story in comic strip fashion. I came across this and duplicated it for BIC children’s missions materials to share. I have used this story many times in missions talks. That comic strip sounds fascinating, Karen. Do you know if the missions office still uses it and/or has a copy? Could be something neat to share here on the blog. I have that “comic strip” and am going to be using it for the “children’s sermon” at Harrisburg BIC on the last Sunday in June. I have enlarged the drawings to make them into power point form. I can send you a copy of the story with Jon’s drawings, the 2 page story I have that was used for BIC children’s missions materials years back. Jon Sider goes to our church. I have told and shown this story many times to small groups of children, never to a large group before. I am a little nervous about it. Hello, Devin. I have always been fascinated by accounts of the death of Myron Taylor. As I recall, this missionary was known for his skills as a driver and as a hunter. Regarding the photo caption: I have not been able to locate the names of any sons of Myron Taylor and Adda G Engle. Daughter Ruth Elizabeth was born in Bulawayo 14 FEB 1911. The three members of the Taylor family arrived in New York, NY from Southampton on 6 APR 1913. Two months later Anna Engle Taylor was born in Abilene Kansas 19 JUN 1913. According to Myron’s July 1916 passport application, his wife and two daughters were to accompany him on the return journey to Africa, expected to commence 10 AUG 1916. Ruth Elizabeth Taylor, age 8, arrived in New York from Southampton on 15 DEC 1919 in the company of Sadie Book and Cora Alvis. Myron, Adda, and Anna Taylor arrived in New York from Southampton on 14 NOV 1925. I do not know the date of their return to Africa. I have no evidence that Ruth Taylor returned to Africa until after her marriage to Chester Wingert. Thus, I believe the young person in the photo likely is Anna Engle Taylor. Adda Taylor and Anna Taylor arrived in New York from Southampton on 25 AUG 1932, eleven months after the death of Myron Taylor. David: Greetings to you as well! Thanks for this clarification. The original caption for this photo, penned on the back of the original copy, indicated “wife and child.” In my haste to complete the post, I must have assumed “son” and written such in the caption. I appreciate your dedication to bringing Anna’s identity to light. Thanks for the comment. Devin, I’m not putting in a plug here, but I contimue to be amazed at the vast amount of information available at ancestry.com. I had already pulled some of this information. The quest for the identity of the youth in the photo led me to re-explore and refine it. As one who grew up on Sikalongo Mission, I too heard the story of Myron Taylor. His grave is on the mission. When my sister died, at age 8 months, she was buried next to Myron Taylor–those graves are side by side and can be seen today. My brother wrote about visiting Dorothy’s grave in 2003. Donna, do you have a picture of the gravesite? I would like to add a picture of Myron Taylor’s gravestone and site to the power point presentation I am making. I knew about your baby sister’s death, and I cannot even begin to understand the depth of the sadness in losing a child so far from home and extended family. I did not know her grave is beside Taylor’s.